commercial shopping core for residents. The neighbouring area of Sunnymead is sometimes referred to in conjunction with Broadmead itself. The area was originally developed by the famous Guinness family, who also developed the British Properties in West Vancouver. Cadboro Bay - A scenic residential area east of the University of Victoria and just north of the Oak Bay border. Cadboro Bay itself has a popular park with a sandy beach (including concrete octopus and sea monster Cadborosaurus), and a charming village shopping area. Cedar Hill - A middle-class, largely older residential area just south of Mount Douglas (formerly Cedar Hill), bounded by Quadra St., Cook St., Finlayson St. - North Dairy Rd., Shelbourne St., and McKenzie Ave. Dominated by the Cedar Hill Golf Course. Cloverdale - In the southwest corner of the municipality, bounded by Tolmie Ave., Douglas St., Saanich Rd., Tattersall Dr., Quadra St., and Cook St. To the south and west is a heavily built-up commercial area, transitioning in areas to industrial zones. Low-rise apartment buildings predominate in sections, with further commercial development along Cook and Quadra Streets. The rest is a diverse mix of middle- and lower-middle-class homes, including some subsidized housing. Cloverdale Ave. (named for a pioneer farm) runs through the centre of the neighbourhood. Cordova Bay - A mixed rural and residential area of newer and older homes, situated east of Elk and Beaver Lakes and north of Broadmead. It is an upper-middle-class area and includes a small "village-like" strip along scenic Cordova Bay Road. It also hosts its own youth soccer club, titled Cordova Bay Soccer Association. Gordon Head - Gordon Head is a seaside neighbourhood. Gordon Head lies north of McKenzie Avenue and east of the Blenkinsop Valley. The University of Victoria is located partly within Gordon Head along the south-east boundary. Finnerty Road separates Gordon Head from the adjacent neighbourhood of Cadboro Bay. The local area is dominated physically by Mt. Douglas, a coastline along Haro Strait, and the central plateau. Lake Hill - Located south of Broadmead, north of McKenzie Avenue, east of the Pat Bay Highway, and west of Borden Road. This is a neighbourhood of mainly postwar lower-middle-class- and middle-class homes with larger infill housing from the 1970s and 1980s. It includes the Christmas Hill Nature Sanctuary. Maplewood is west of the Cedar Hill golf course, with borders of Quadra Street on the west, McKenzie Avenue on the north, Maplewood- Blenkinsop Road on the east and Cook Street. It is an older, treed area with many character homes and winding streets. There is a "star" intersection located at Camrose Crescent, Crown Crescent, and Salsbury Way. Maplewood contains many older residences of historical significance: Brown, Clovelly, Duke, French, Holland, Kitchin, Rockside and Wayne residences. Mt. Douglas - The area surrounding Mount Douglas, west of Shelbourne Street and Cedar Hill Road, north of McKenzie Avenue, east of Blenkinsop Road, and bounded to the north by Haro Strait and Cordova Bay Road. 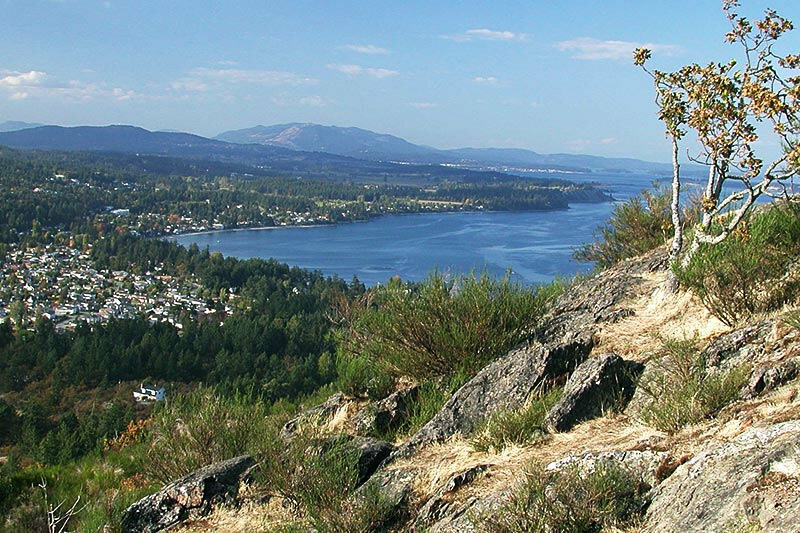 The most prominent feature of this area is the mountain itself and the surrounding Mount Douglas Park, which includes a lookout near the summit of the mountain with an impressive view of Greater Victoria. Mt. Tolmie - Bounded to the west and south by the Victoria border, along Shelbourne St. and Richmond Rd., to the east by the Oak Bay border, along Foul Bay Road, and to the north by Cedar Hill Cross Rd. This area contains the Lansdowne Campus of Camosun College, St. Michael's University School, the northern pavilions of Royal Jubilee Hospital, and of course the panoramic Mt. Tolmie itself. A mixture of commercial establishments and low-rise apartment blocks lie along the western and southern extremities, and middle-class homes farther east. North Quadra - A nearly exclusively suburban area, predominated by single-family homes, and bounded on the south by McKenzie Avenue, the west by the Pat Bay Highway, and the east by the Blenkinsop Valley. Only at the southern margins, along McKenzie, is there any commercial activity and a few apartment blocks. The area is dominated by Christmas Hill, the summit of which is part of the Swan Lake Christmas Hill Nature Sanctuary (the lake and the hill are only connected by a narrow footpath, but are administered by the same society). The area is also home to Rogers and Lakehill Elementary (Lakehill being the former name of Christmas Hill, with its prominent views of Swan and Blenkinsop lakes - the latter actually being earlier called "Lost Lake"). Queenswood is a wooded, seaside neighbourhood located north of Cadboro Bay and northwest of Ten Mile Point. Originally developed in the 1940s, Queenswood is characterized by winding roads and secluded character homes on large, treed estates. Immediately west of Queenswood are the 14-acre (57,000 m2) wooded lands containing the former Queenswood Centre for Spiritual Development, now owned by the University of Victoria. Swan Lake - Lying south of McKenzie, east of the Patricia Bay Highway, north of Tattersall Dr., and west of Quadra St. A pleasant, treed area of older middle-class homes, at the centre of which is Swan Lake Nature Sanctuary. Ten Mile Point is the most easterly point on Vancouver Island. This wooded upper-class area is located east of Cadboro Bay and the University of Victoria. Ten Mile Point is an exclusive, expensive, peninsular neighbourhood known for its secluded beaches, private estates and waterfront properties. While Ten Mile Point is located within the urban part of Saanich, its setting has a quiet, rural feel.